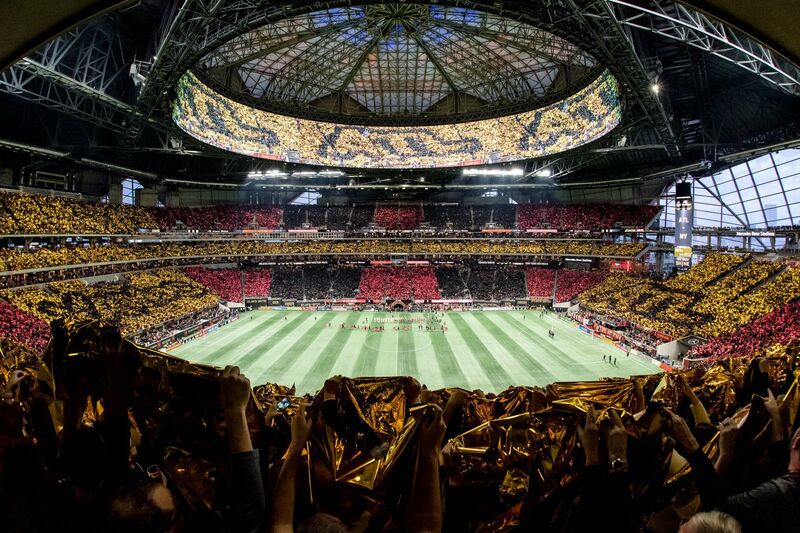 Atlanta United fans showed off a stadium-wide tifo display before their home game in the MLS Cup Playoffs Eastern Conference final series against the New York Red Bulls, at a full-to-capacity Mercedes-Benz Stadium. If you watch the MLS Cup final on Saturday night, you’ll see a scene that you might not believe. Yes, there really will be some 72,000 people in Atlanta’s Mercedes-Benz Stadium cheering on Atlanta United against the Portland Timbers. It will be a cauldron of noise, color and passion - and talent on the field, too - the likes of which American soccer has rarely ever seen. You might sit back and wonder for a moment whether such a scene could ever play out in Philadelphia. Could the Union some day pack Lincoln Financial Field and command the city’s attention with swashbuckling players who elevate the team to MLS' elite? Then you’ll snap out of that daydream, and you’ll remember how things actually are around here: a stadium that’s rarely full, a team that barely resonates locally, and a history of underwhelming players who’ve rarely contended for trophies. The Union and Atlanta United are in the same league. They play each other twice a year, and compete against the same opponents the rest of the time. So why does it feel like they’re so far apart? Union fans know the answer already, and so does everyone else around MLS. Atlanta spends so much more money to achieve success - not just on player salaries, but on transfer fees, scouts and training infrastructure - that even Union owner Jay Sugarman has admitted his team can’t keep up. Sugarman’s confession came on the day in August when Ernst Tanner was introduced as the Union’s new sporting director. Later, he added: “We’re never going to just line up and try to go head-to-head with teams that have two, three, four times the revenue model we do. That’s suicide, and it won’t work." Philadelphia Union majority owner Jay Sugarman. Sugarman and other Union executives have said for years that they think they can close the gap by out-innovating other teams, and by developing quality players from within. They’re right to believe in a strong academy, and in that regard, they’ve put their money where their mouth is. They’ve had real success with Mark McKenzie, Auston Trusty, Brenden Aaronson and others. And they aren’t wrong that spending big is the only way to win. Like other American sports, teams with less money can outsmart rivals that spend more. Gregg Berhalter earned the U.S. men’s national team coaching job because his Columbus Crew did that. But the Union haven’t done it, and the reason why is simple. The rest of MLS innovates too, and Atlanta is one of many teams that innovates better than the Union. Take foreign player scouting as an example. Atlanta launched with a fleet of scouts, while the Union have only focused on that recently. Atlanta prioritized South American players from the start, noting MLS' long history of finding quality there; the Union ignored the continent for years after the scandal-filled end to the Peter Nowak era. Thankfully, Ernst Tanner has started to right that wrong. Nowhere is the gap more clear than in how the two teams market themselves. Atlanta made a big push into the collective conscience of the young professionals in the city’s modern downtown core, and it has paid off in the diversity of the club’s MLS-leading attendances. That’s an innovation the Union haven’t come up with yet. They still focus on the same suburban, have-a-nice-day-out families with kids who play youth soccer that they always have. Talen Energy Stadium is Major League Soccer's fourth-smallest venue at 18,500 seats, yet it's rarely full - even when the Union are winning. Atlanta also has the Union beaten in marketing to their local Hispanic population. The Union have had just two Spanish-language PR reps in their history, and none since 2016. Their lack of resonance in the Philadelphia region’s rapidly-growing Hispanic population is glaring. That includes local Spanish-language TV stations and newspapers which haven’t shown up to Chester in years. Fortunately, that’s being addressed this winter too. And it’s still a headache to get to Talen Energy Stadium without a car. Yes, you can do it by SEPTA if you plan it out right; yes, the Union added $15-a-ticket shuttle buses from Center City this year. But after an initial burst of buzz, the buses weren’t promoted much on social media or at the city’s thriving soccer bars. Yes, these subjects have been raised on this page before. (And yes, this writer knows of those bars from experience.) But the issues still haven’t been solved, even as the Union prepare for their 10th season. Simply put, if the team in the nation’s fourth-largest TV market so clearly can’t keep up with MLS' best, why should fans think that team will ever actually win something? And if fans choose to not spend their money on a team that isn’t earning it, can you blame them? Take it from Atlanta United midfielder Jeff Larentowicz, a Chestnut Hill Academy product who has played for five MLS teams in his 12-year career. “For too long, within the single-entity structure [on which MLS is built], the bottom gets pulled up by the top,” he said on the night Atlanta booked its title game berth. “Hopefully other clubs around the league look around and say, ‘We’ve got to do this to keep up.’ It might take some time, and the same clubs winning over and over - the ones that invest, the ones that want to win - but that’s exactly it." Saturday night will bring the latest proof that Larentowicz is right.